Paranthropus (from Greek παρα, para "beside"; άνθρωπος, ánthropos "human") is a genus of extinct hominins that lived between 2.6 and 1.1 million years ago. Also known as robust australopithecines, they were bipedal hominids probably descended from the gracile australopithecine hominids (Australopithecus) 2.7 million years ago. The genus is characterised by robust craniodental anatomy, including gorilla-like sagittal cranial crests which suggest strong muscles of mastication, and broad, grinding herbivorous teeth. However, Paranthropus skulls lack the transverse cranial crests of modern gorillas. The low rate of enamel fractures on Paranthropus teeth suggest this characteristic craniodental anatomy evolved to cope with a diet of tough vegetation, rather than hard foods. A partial cranium and mandible of Paranthropus robustus was discovered in 1938 by a schoolboy, Gert Terblanche, at Kromdraai B (70 km south west of Pretoria) in South Africa. It was described as a new genus and species by Robert Broom of the Transvaal Museum. The site has been excavated since 1993 by Francis Thackeray of the Transvaal Museum. A date of at least 1.95 million years has been obtained for Kromdraai B.
Paranthropus boisei was discovered by Mary Leakey on July 17, 1959, at the FLK Bed I site of Olduvai Gorge in Tanzania (specimen OH 5). Mary was working alone, as Louis Leakey was ill in camp. She rushed back to camp and, at the news, Louis made a remarkable recovery. They refrained from excavating until Des Bartlett had photographed the site. In Louis recorded a first name, Titanohomo mirabilis, reflecting an initial impression of close human affinity. Louis and Mary began to call it "Dear Boy". Recovery was halted on August 7. Dear Boy was found in context with Oldowan tools and animal bones. The fossil was published in Nature dated August 15, 1959, but due to a strike of the printers the issue was not released until September. In it Louis placed the fossil in William King Gregory's subfamily Australopithecinae, creating a new genus for it, Zinjanthropus, species boisei, which is no longer used. "Zinj" is an ancient Arabic word for the coast of East Africa and "boisei" referred to Charles Watson Boise, an anthropological benefactor of the Leakeys. Louis based his classification on twenty differences from Australopithecus. At that time palaeoanthropology was in an overall mood to lump species. Consequently, the presentation of Zinj during the Fourth Pan-African Congress of Prehistorians in July in the then Belgian Congo, at which Louis was forced to read the delayed Nature article, nearly came to grief for Louis over the creation of a new genus. Dart rescued him with the now famous joke, "... what would have happened if Mrs. Ples had met Dear Boy one dark night." The battle of the name went on for many years and drove a wedge between Louis and Sir Wilfrid LeGros Clark, from 1955, who took the Paranthropus view. On the other hand, it brought the Leakeys and Dr. Melville Bell Grosvenor of the National Geographic Society together. The Leakeys became international figures and had no trouble finding funds from then on. The Zinj question ultimately became part of the Australopithecus/Paranthropus question (which only applied to the robust Australopithecines). All species of Paranthropus were bipedal, and many lived during a time when species of the genus Homo (which were possibly descended from Australopithecus), were prevalent. Paranthropus first appeared roughly 2.7 million years ago. Most species of Paranthropus had a brain about 40 percent the size of that of a modern human. There was some size variation between the different species of Paranthropus, but most stood roughly 1.3 to 1.4 m (4 ft 3 in to 4 ft 7 in) tall and were quite well muscled. Paranthropus is thought to have lived in wooded areas rather than the grasslands of Australopithecus. Paranthropus is thought to be bipedal based on the anatomical structure of its hips, legs, and feet, which resemble both its ancestor, Australopithecus afarensis, and modern humans. The pelvis is similar to A. afarensis, but the hip joint, including the femoral head and acetabulum, are smaller in Paranthropus. The similar hip structure between A. afarensis and Paranthropus implies that they had a similar walking gait, and that Paranthropus moved like the "gracile australopiths". They show anatomical similarity to modern humans in the big toe of their foot and their well developed plantar aponeurosis. The hallux metatarsal shows increased base for more internal support, and more distal articular surface which causes more connection and support to the other bones in the foot. The extra support in the big toe and extensive plantar aponeurosis shows that Paranthropus had hyperextension of their toes for a "toe-off" gait cycle, characteristic of modern bipedalism in humans. The behavior of Paranthropus was quite different from that of the genus Homo, in that it was not as adaptable to its environment or as resourceful. Evidence exists in its anatomy, which was specifically tailored to a diet of grubs and plants. This would have made it more reliant on favorable environmental conditions than members of the genus Homo, which consumed a much wider variety of foods. Therefore, because it was a specialist species, it had more difficulty adapting to a changing climate, leading to its extinction. Cladogram of early hominin evolution. Evolutionary biologist Richard Dawkins notes "perhaps several different species" of robust hominids, and "as usual their affinities, and the exact number of species, are hotly disputed. Names that have been attached to various of these creatures...are Australopithecus (or Paranthropus) robustus, Australopithecus (or Paranthropus or Zinjanthropus) boisei, and Australopithecus (or Paranthropus) aethiopicus." 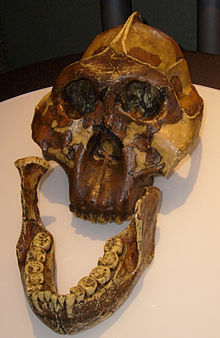 Opinions differ whether the species P. aethiopicus, P. boisei and P. robustus should be included within the genus Australopithecus. The emergence of the robusts could be either a display of divergent or convergent evolution. There is currently no consensus in the scientific community whether P. aethiopicus, P. boisei and P. robustus should be placed into a distinct genus, Paranthropus, which is believed to have evolved from the ancestral Australopithecus line. Up through the late 20th century the majority of the scientific community included all the species of both Australopithecus and Paranthropus in a single genus. Currently, both taxonomic systems are used and accepted in the scientific community. However, although Australopithecus robustus and Paranthropus robustus are used interchangeably for the same specimens, some researchers, beginning with Robert Broom, and continuing with people such as Bernard A. Wood, think that there is a difference between Australopithecus and Paranthropus, and that there should be two genera. However, this discussion appears largely moot as the genus Homo also appears to have emerged in the genus Australopithecus, and a genus can formally not be part of another genus. For the most part the Australopithecus species A. afarensis, A. africanus, and A. anamensis either disappeared from the fossil record before the appearance of early humans or seem to have been the ancestors of Homo habilis, yet P. boisei and P. aethiopicus continued to evolve along a separate path distinct and unrelated to early humans. Paranthropus shared the earth with some early examples of the genus Homo, such as H. habilis, H. ergaster, and possibly even H. erectus. Australopithecus afarensis and A. anamensis had mostly disappeared by this time. There were significant morphological differences between Australopithecus and Paranthropus, although the differences were found on the cranial remains. The postcranial remains were still very similar. Paranthropus was more massively built craniodentally and tended to contain gorilla-like sagittal crests on the cranium which anchored massive temporalis muscles of mastication. Species of Paranthropus had smaller braincases than Homo, yet they had significantly larger braincases than Australopithecus. Paranthropus is associated with stone tools both in southern and eastern Africa, although there is considerable debate whether they were made and utilized by these robust australopithecines or contemporaneous Homo. Most believe that early Homo was the tool maker, but hand fossils from Swartkrans, South Africa, indicate that the hand of Paranthropus robustus was also adapted for precision grasping and tool use. Most Paranthropus species seem almost certainly not to have used language nor to have controlled fire, although they are directly associated with the latter at Swartkrans. In 2011 Thure E. Cerling of the University of Utah and colleagues, published a study in the Proceedings of the National Academy of Sciences of their work with the carbon isotopes in the enamel of 24 teeth from 22 Paranthropus individuals who lived in East Africa between 1.4 million and 1.9 million years ago. Their results suggest that Paranthropus boisei dined more heavily on C4 plants, possibly as a part-time graminivore (as many grass species are C4 plants), than any other human ancestor or human relative studied to date. It is debated whether the large molars of Paranthropus was an adaptation to eating hard foods, however recent research, including a low rate of enamel fractures in Paranthropus robustus, suggests a diet containing tough vegetation was more commonly consumed. ^ a b Dawkins, Richard (2004). The Ancestor's Tale: A Pilgrimage To the Dawn of Life. London: Weidenfeld & Nicolson. p. 77. ISBN 978-0-297-82503-6. ^ a b Towle, Ian; Irish, Joel D.; Groote, Isabelle De (2017). "Behavioral inferences from the high levels of dental chipping in Homo naledi". American Journal of Physical Anthropology. 164 (1): 184–192. doi:10.1002/ajpa.23250. ISSN 1096-8644. PMID 28542710. ^ Morell, Virginia (2011). Ancestral Passions: The Leakey Family and the Quest for Humankind's Beginnings. Simon & Schuster. pp. 180–184. ISBN 9781439143872. ^ a b Morell, Virginia (2011). Ancestral Passions: The Leakey Family and the Quest for Humankind's Beginnings. Simon & Schuster. p. 185. ISBN 9781439143872. ^ Morell, Virginia (2011). Ancestral Passions: The Leakey Family and the Quest for Humankind's Beginnings. Simon & Schuster. p. 186. ISBN 9781439143872. ^ Wood B, Richmond BG (July 2000). "Human evolution: taxonomy and paleobiology". Journal of Anatomy. 197 (1): 19–60. doi:10.1046/j.1469-7580.2000.19710019.x. PMC 1468107. PMID 10999270. ^ Macchiarelli R, Bondioli L, Galichon V, Tobias PV (February 1999). "Hip bone trabecular architecture shows uniquely distinctive locomotor behaviour in South African australopithecines". Journal of Human Evolution. 36 (2): 211–32. doi:10.1006/jhev.1998.0267. PMID 10068067. ^ a b c Wood, B. & Strait, D. (2004). "Patterns of resource use in early Homo and Paranthropus". Journal of Human Evolution. 46 (2): 119–162. doi:10.1016/j.jhevol.2003.11.004. PMID 14871560. ^ Saylor, Beverly Z.; Scott, Gary; Levin, Naomi E.; Deino, Alan; Alene, Mulugeta; Ryan, Timothy M.; Melillo, Stephanie M.; Gibert, Luis; Haile-Selassie, Yohannes (2015). "New species from Ethiopia further expands Middle Pliocene hominin diversity". Nature. 521 (7553): 483–488. doi:10.1038/nature14448. ISSN 1476-4687. PMID 26017448. ^ Susman RL (May 1988). "Hand of Paranthropus robustus from Member 1, Swartkrans: fossil evidence for tool behavior". Science. 240 (4853): 781–4. doi:10.1126/science.3129783. PMID 3129783. ^ Cerling TE, Mbua E, Kirera FM, et al. (June 2011). "Diet of Paranthropus boisei in the early Pleistocene of East Africa". Proceedings of the National Academy of Sciences of the United States of America. 108 (23): 9337–41. doi:10.1073/pnas.1104627108. PMC 3111323. PMID 21536914. ^ Sponheimer, Matt; Lee-Thorp, Julia; De Ruiter, Darryl; Codron, Daryl; Codron, Jacqui; Baugh, Alexander T.; Thackeray, Francis (2005-03-01). "Hominins, sedges, and termites: new carbon isotope data from the Sterkfontein valley and Kruger National Park". Journal of Human Evolution. 48 (3): 301–312. CiteSeerX 10.1.1.421.8468. doi:10.1016/j.jhevol.2004.11.008. ISSN 0047-2484. PMID 15737395. Look up paranthropus in Wiktionary, the free dictionary. "Hominidae". Mikko's Phylogeny Archive. Archived from the original on 2008-01-10. "Early Human Phylogeny". Smithsonian Institution. "Paranthropus". Human Evolution—A Look At Our Ancestors. Humboldt State University. Archived from the original on 2001-04-14. "What Killed Paranthropus?" (Abstract). New Scientist (2434). 2004-02-14.